The project aims to have 3 main line locomotives named "PATRIOT", "VALOUR" and "REMEMBRANCE" replicating locomotives which the LNWR, GCR and LB&SC Rly named after WW1 to honour their fallen employees of the war. Each locomotive will be owned a separate company just as happened after WW1, Dapol will then produce 250 limited edition models of each after they are named these will be available from www.projectrailwayhonour.com at a price of £105 each with the proceeds going to one of 3 service charities which his also named on the locomotives. A cab ride from Crewe to Carlisle on a freight service courtesy of FREIGHTLINER. p.s not being funny but do you spell it "Rememberance" or "Remembrance"? I always use the second spelling but don't know if it might have changed over time. I just wanted to publicly pay tribute to Gareth in managing to get this ambitious project off the ground. 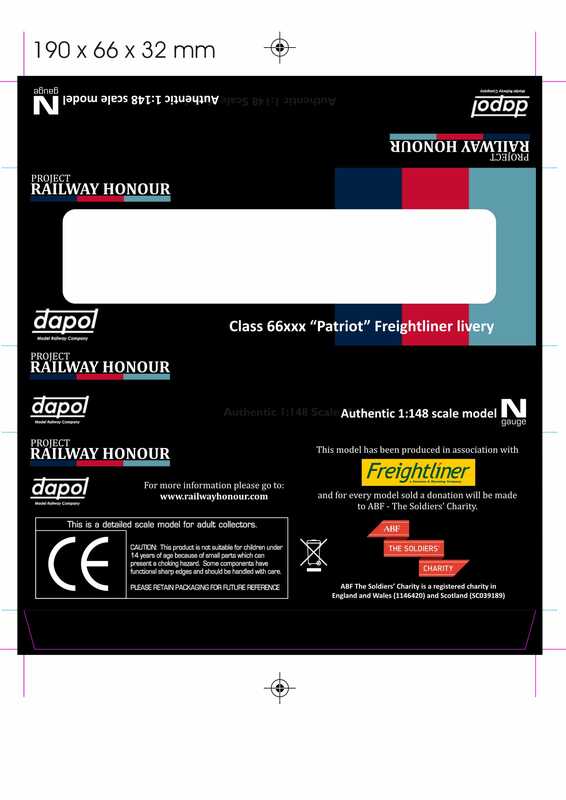 He has convinced Freightliner to name a full-size locomotive, in a new variant of their livery, and Dapol to produce an exclusive model, with proceeds going to a very good cause. Frankly I am amazed at what he has achieved, and we at Revolution are very happy to offer the modest support we have. Count me in for all three ! I will definitely be having all 3, especially after our chat on Saturday. Like Ben, I can't emphasise enough what a great job Gareth has done. To get one company to rename a loco is a mammoth task, to be well on the way to convincing others AND to get limited editions produced is just incredible. Well done Gareth. I remember well when you said to me that you hoped to get these models off the ground, but then it went silent. So, I'm amazed by what you've achieved so far. What a great idea and you've done a fantastic job! As I can only afford one I'll have to wait and see which locos are selected before committing. But one will be coming my way. Can I add my voice that this is a great idea and what brilliant raffle prizes. Incidentally the spelling is "Remembrance" - I play for a Remembrance Festival every year. There is of course a history if misspellings of locomotive names the GWR in braod gauge days was a culprit. Thank you very much for all your kind comments and support you have all shown on here and at TINGS, it has been personally overwhelming. @MacRat spoke about livery on the Revolution Pendolino thread - Originally all three of the locomotives were painted in the same colour scheme in an agreement between all three rail companies, when the liveries were removed to be inline with each individual companies liveries there was uproar from the public especially from within the ranks of railway employees who had served in the trenches. This livery was Black with from what I understand was gold lining. While I would love to have had the ability to persuade the rail companies to recreate this unfortunately the costs are so high that the money raised would not even meet the cost of repainting. The one thing I can assure you all is that each of the nameplates will be an nod to the original nameplates carried by the steam locomotives after world war one. Have you managed to persuade Dapol to do the livery as well or just the plates?? 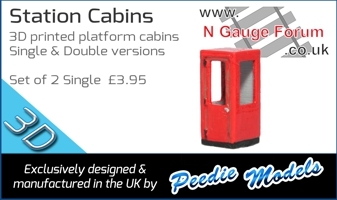 Dapol are doing the model identical to the loco with the new Genesse and Wyoming markings as well as the Zero Injuries logos not just the namplates. As far as we are aware this will be the first model in the N gauge market which will carry this new livery alteration which is an added bonus although by no means intended but who am I to argue it the loco Frieghtliner offered nd i was more than willing to grasp for a number of reasons!